Speaking of which: there’s no real reason or excuse for the radio silence and missed update this past weekend. Things just kind of…happened? Like I said, no excuse, but let’s just keep moving forward. Chapter 16 is next, and it’s the last full chapter of the comic! I spy a centaur robot. 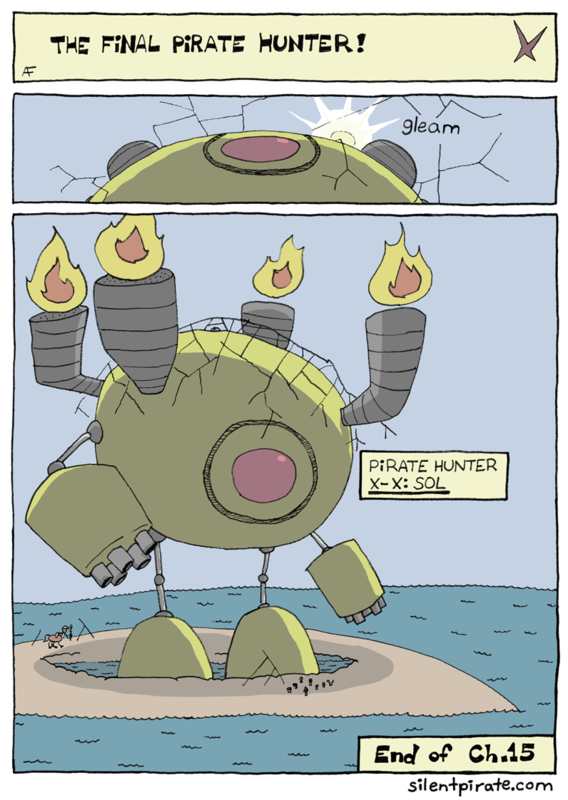 A Pirate Hunter-hunter like Pluto, perhaps? Ignacio’s been busy. You actually called there being a centaur robot previously, though you were referring to Uranus’ spider-ness! 1. I usually update twice a week, once midweek and once on the weekend. If I miss an update I post filler or update a couple days late. Completely missing updates like I did without any warning or notice is not a good thing. 2. There’s a short epilogue (about 4 pages) after Chapter 16, but yes, then that’s it. I’ve been working on and off on a new comic, but it’ll be a lot more complicated than Silent Pirate so it may take a while to get past the planning stages. I’m aiming for an April launch at the moment. Ah, yes, the giant X-7 discussion. Can’t recall the reason behind why I said spiders are dumb. 1. I’m just unfamiliar with the term ‘radio silence’ is the thing. 2. Oh nice! Any hints to what it might be about/look like? They don’t get much bigger than that do they?? Going for a Jaeger here aren’t we! LOL! If you think about it, the hunters were (almost) already Jaeger-sized. Sol here is more of a giant, murderous, weaponized battle fortress. Calm down, and look on the ‘sunny’ side of life.